NHS funding is available to cover 100% of care fees for elderly people with predominantly health needs. This is called NHS Continuing Healthcare. (It’s also called ‘Continuing Care’ or ‘fully-funded nursing care’.) There is an assessment process to go through. However, many people are not told about this funding, and many families who ask about it on behalf of an elderly relative are simply told they won’t get it – and that there’s no point in doing an assessment. This is not only completely wrong (because everyone with health needs going into care should be assessed for Continuing Care), but it also puts families off pursuing things further. It means elderly people often wrongly lose their homes and everything they own to pay for care that should be paid for by the NHS. It is one of the biggest scandals in elderly care in the UK. No one can possibly make a decision about funding until an assessment has been done! If your relative needs to go into a care home, or needs full-time care at home, they should be assessed for NHS Continuing Healthcare ideally at the start, but certainly within three months of starting to receive care. If your relative is in hospital, they should be assessed BEFORE they’re discharged. Again, no assessor (or care home nurse) can make a judgment about this without doing an assessment. The first assessment is a screening assessment called the Checklist.This determines whether your relative will receive a second full assessment using the Decision Support Tool. Make sure you’re present at every assessment. The eligibility criteria for Continuing Care look at your ongoing health needs, not how long you have left to live. There’s no limit to the length of time you can receive Continuing Care, and it has nothing to do with how close you are to the end of your life. 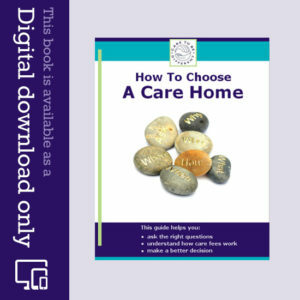 There may not be a Continuing Care contact where your relative is based, but that’s irrelevant. The NHS must arrange for someone to be available to do the assessment. 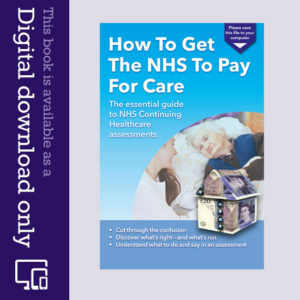 If your relative’s care needs are primarily health needs, it doesn’t matter what their full-time care costs; the NHS has a legal duty to pay for it, including the costs of accommodation in a care home. It doesn’t matter how busy the local NHS Continuing Care Department is – or how busy any other assessor is – your relative should be properly assessed. As your relative’s representative, you also have the right to appeal any decisions you don’t agree with. A family called us to say that their relative was desperately ill and had significant healthcare needs, but had been told none of that mattered because the elderly person could still swallow. The Continuing Care assessment looks at a range of health needs, from mobility to symptom control, and from cognition to breathing, including those needs arising from dementia. It is not, and never has been, solely about the ability to swallow. I have written to Jeremy Hunt about the CHC scandal and the press needs to be aware of this. Let us know if you receive a response, Anne. At this point Simon you may need to take your case to the regional NHS National Commissioning Board – to an Independent Review Panel (IRP). It’s worth checking with the local NHS to see if there are any further Dispute Resolution Meetings that need to be scheduled. If not, ask them for details of the IRP. No, Angela, it is the assessment criteria for NHS Continuing Care that are “outrageous” and “a scandal”. I completely agree with the implications of Simon’s comments. My mother died in April from advanced Parkinson’s, chronic heart disease and 8 other conditions. She was also doubly incontinent, had no mobility, had difficulty eating and was losing her mind. She needed double-handed care while living at home. We were in the process of a 2nd attempt to get CC eligibility when she died. I continued the process as CC can be applied retrospectively for the last 3 months of care but even this was turned down. One of the criteria for having a primary health need, according to NHS CC, is that the medical condition should be”unpredictable”. So you can be terminally ill but as long as your condition is “predictable” you are unlikely to have a primary health need…. It’s no good appealing to the NHS on the basis of such crass criteria. The scheme must be challenged and exposed for the scam that it is! Thanks for your comment Andrew. The whole system is flawed and contrived, and designed to stop people accessing the free NHS healthcare available to the rest of the population. The care fees reclaim deadlines imposed last year are equally outrageous, and the Continuing Care assessment frameworks, criteria, processes, etc. are questionable in law. However, families need a way to challenge the outcome of assessments, and the information on our blog and website is designed to help people do that – and it’s good when we hear back from families who have successfully obtained NHS funding by using our information and advice. I agree though that the whole web of Continuing Care assessments, ‘eligibility’ criteria and scores is a scandal in itself. 8	Totally immobile all movements have to be done by carers or hoist cannot even move position in bed himself. 10	Has nutritional needs cannot feed himself taking minimal amounts of fluids and minimal amounts of pureed food and has lost a lot of weight. I have been told yesterday that he is not eligible for FAST Track CHC funding – I asked why and was told there was not enough information on the form submitted – I did comment well I suppose he needs to be dead to be considered. – The whole NHS CHC Funding scenario is a complete and utter joke. My mother has now been in a care home for 3 years, self funded. She is PEG fed, doubly incontinent, no mobility at all and has virtually no cognition. She is reliant on all her needs by the Care Home workers. She has been refused CC funding twice now as she “does not have a primary health care need and her needs can be met by the nursing staff and care workers”. She receives the NHS nursing care allowance, circa £ 108/ week. Her care home fees are £4100.00/month.